Lovely weekend riding weather. I love so cal! 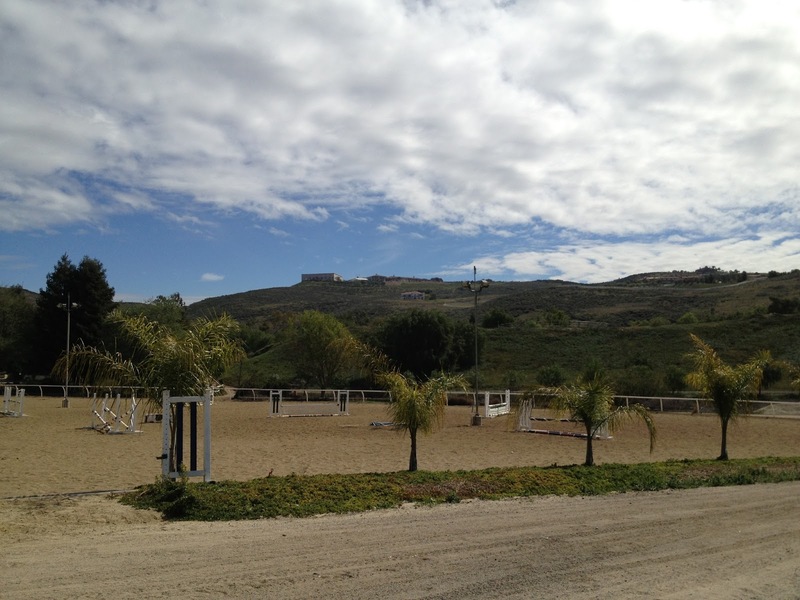 Laurie was out of town this past weekend, taking some other clients to the Twin Rivers horse trials up in Paso. So, last minute, I decided to take a lesson with the resident dressage trainer at our facility: Chemaine Hurtado of Symphony Dressage. I met her at the Dr. Christian Schacht clinic in January, and came away very impressed with her horses. She is friendly and approachable, and according to her website she started off competing in eventing and then switched to dressage due to her horse’s injury, which I think is noble. She is competitive at the 4* and international dressage level. She offers a discount on your first lesson with her – only $25 for a half hour, so I was game to give her a try. Given that he had been ridden the day before, Hemie was uncharacteristically amped. It was our first time in a dressage arena (ever), and there was a screaming horse-eating baby in colorful clothes nearby, and a group jump lesson across the way. Hemie was particularly looky-loo, but Chemaine specifically instructed me not to turn his head away from the distractions as that stops/shortens his stride, increasing tension rather than encouraging relaxation. She had us do an interesting exercise I’ve never done before: true bend, then counter-bend, then stretch down, only using seat pressure. No reins or legs to encourage bending! Specifically I had to sit heavy on the seat-bone on the side you’re asking them to bend to. If you want them to bend right, sit heavy on right seat-bone and sink weight into right stirrup (not applying right leg pressure, though). 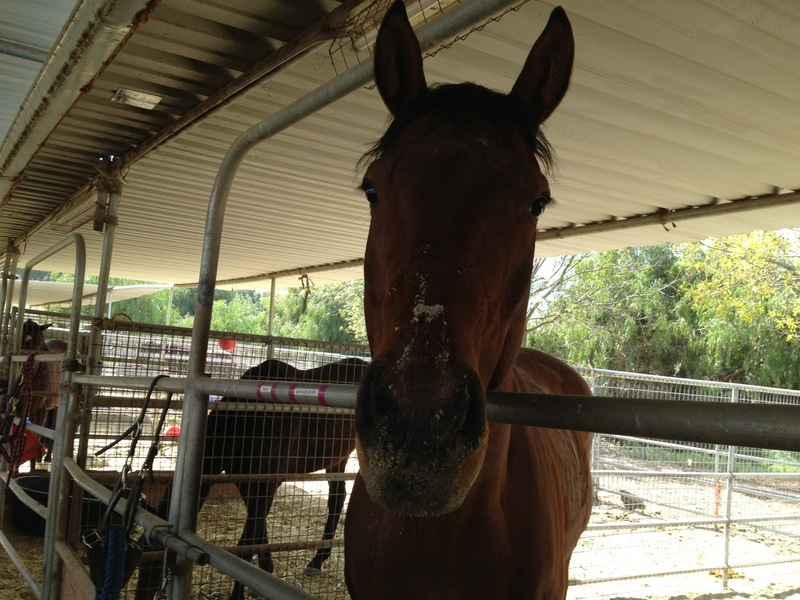 The idea is for the horse to lift up against that pressure, carrying us both via the bend. I also had to be sure to move my shoulders and look in the direction of the bend. We did this on a figure 8, then on circles, then on a straight line, at the walk and trot. She complimented my riding and my feel several times, which was encouraging. However she also asked me to have way longer reins than I’m used to (I normally get in trouble for them being too long!). And she had me sit back on my tailbone more than I’m used to, which turned out to be helpful with the exercise. Hemie responded surprisingly well to the seat pressure, though I do think he was looky-loo much longer than he otherwise would have been if I had been allowed to turn his head away and put him to work in a more direct manner than just bending while walking. At one point Chemaine even said something like “I’m sure you could get him on the bit and put him to work, but we want him to enjoy dressage and this new arena, by being relaxed and staying relaxed.” implying that he would get tense if I asked him to get on the bit (apparently this has been her experience with OTTBs) though that is not normally what Hemie does. Oh well. Overall I enjoyed the experience and would be open to taking another lesson from her in the future. Afterwards Hemie got his normal bucket o’ goodies. Just beet pulp and rice bran at this point, actually. Somehow he manages to wear a good portion of it on his face. Silly pony. Dressage lesson tonight, then hopefully XC schooling this weekend! Sounds like an awesome lesson!!! Unfortunately I haven't run into them *except* for Chemaine when I sought her out to ask about getting a lesson. In fact, even though there's dozens (maybe even a hundred?) horses at the facility, I am one of the only people who goes out in the evenings during the week and I hardly see other people around!